Kingston's DataTravelerÂ Workspace is certified by MicrosoftÂ for use with WindowsÂ To Go1, a feature of Windows 8 or 8.1 Enterprise2. 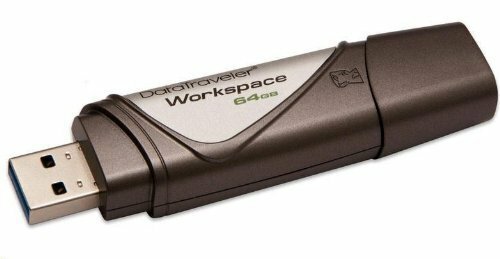 Kingston's DataTraveler Workspace for Windows To Go is a fully manageable corporate Windows 8 workspace on a specially configured, bootable USB drive. It allows IT administrators to easily support such work styles as "bring your own PC," mobile workforce and the needs of contingency staff, who need access to the corporate environment without security compromise. This USB 3.0 drive incorporates SSD controller technology to produce a high-performance, low-latency drive. It's factory configured as a fixed drive so it boots through USB 3.0 or USB 2.0 ports on compatible hardware that has been certified for use with either Windows 7, 8 or 8.1.